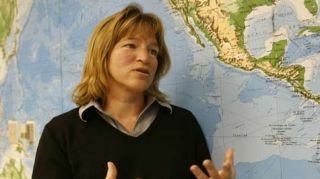 Accomplished planetary geologist Ellen Stofan has been appointed NASA's chief scientist, the space agency announced today (July 29). Stofan — an expert on the terrain of Venus, Mars, Saturn's moon Titan, and Earth — will assume her new post on Aug. 25. She will be NASA Administrator Charles Bolden's top advisor on all of the agency's science-related programs, planning and investments. Her appointment comes at a time when budget cuts threaten to choke the agency's funding for planetary science. "Ellen brings an extraordinary range of scientific research knowledge and planetary exploration experience to the chief scientist position," Bolden said in a statement. "Her breadth of experience and familiarity with the agency will allow her to hit the ground running. We're fortunate to have her on our team." Stofan is an associate member of the radar team for the Cassini mission to Saturn and a co-investigator for a radar instrument on the Mars Express orbiter called MARSIS, which probes beneath the Red Planet's surface to search for liquid and solid water. Stofan also was principal investigator on the Titan Mare Explorer, or TiME, a proposed mission to send a floating lander to an alien sea on Saturn's largest moon Titan, according to a NASA statement. From 1991 to 2000, Stofan served in a number of senior positions at NASA's Jet Propulsion Laboratory in Pasadena, Calif. She was chief scientist for NASA's New Millennium Program that aimed to develop and test technologies for future missions; deputy project scientist for the Magellan mission that sent a robotic probe to Venus; and experiment scientist for SIR-C, which was an instrument that obtained radar images of Earth during two space shuttle flights in 1994, according to a statement from NASA. In coming back to NASA, Stofan will leave the consulting firm Proxemy Research in Laytonsville, Md., where she served as vice president. Stofan received her master's degree and doctorate in geological sciences from Brown University in Providence, R.I., and her bachelor's degree from the College of William and Mary in Williamsburg, Va., NASA said.